A bare room, a road to nowhere. Vladimir and Estragon, the protagonists in Samuel Beckett’s play are two sad, gentle, graceful clowns in this melancholic miniature on stretching out time. They wander around lost in the spotlight, come together only to sink into themselves once again. They do not know what they are waiting for and whether their waiting will be worth it. 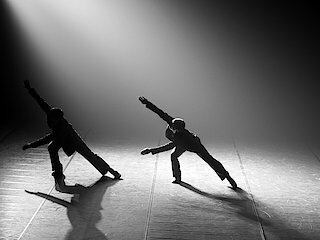 “Waiting for Godot” was created by the Lithuanian National Opera as part of the “Creative Impulse" project, which gives the dancers the opportunity to develop their own choreography.